Hearing issues are a persistent problem for many people and can lead to feelings of isolation or create difficulties with communication. 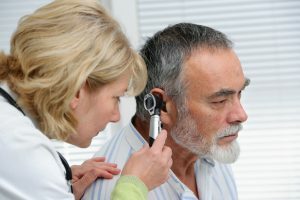 In fact, current research shows that nearly one in three people in the US between the ages of 65 and 74 suffers from some degree of hearing loss or impairment. Hearing impairment can be a serious safety issue, as sufferers may have difficulty being alerted by warning alarms or bells or understanding medical professionals. Below are some tips for identifying and addressing hearing loss. Many factors can contribute to hearing loss. Regular exposure to unusually loud noises is a very common cause of hearing impairment, but certain diseases and other medical conditions can also impact hearing. Some people have a hereditary predisposition to hearing loss, and for others it is simply a product of aging. There are two types of hearing loss: sensorineural and conductive. Sensorineural hearing loss occurs when there is significant damage to the auditory nerve and inner ear. This type of hearing loss usually results in permanent damage. Conductive hearing loss is generally temporary and occurs when sound waves can’t reach the ear due to a buildup of fluid or other temporary blockage. Hearing loss can pose a serious safety issue. Those who are hearing impaired may be unable to hear warnings from alarms, people or vehicles and also may be unaware of someone asking important questions. If left untreated, hearing loss can lead to feelings of embarrassment, isolation or depression and the condition can really take an emotional toll on sufferers. Those with hearing loss may stop participating in social events, may become withdrawn and are often mistaken as uncooperative or confused because they are not responding appropriately to a stimulus. Frequently turning up the volume on the TV or radio. Difficulty following along or participating in conversations. Regularly asking people to repeat themselves or speak more slowly. Inability to hear the phone ring. Avoiding social gatherings or refusing to participate in conversations. Finding that conversations between other people sound garbled or muffled. Inability to follow a conversation between two or more people. If you or a loved one are suffering from hearing loss, you should seek the advice of a medical professional as many options are available. Your general physician may be able to diagnose and treat the problem, or you may be referred to a specialist. There are many types of devices that can be helpful for people with impaired hearing. Alert systems work with doorbells, smoke detectors and alarm clocks to send visual signals (such as a flashing light) or vibrations. Some people use the vibration setting on their smartphone as an alert for phone calls. Hearing aids are electronic devices that are placed in the ear to amplify sounds. There are several types of hearing aids, and you may want to test a few to find the one that is best for you. Cochlear implants are another type of electronic device for people with severe hearing loss, but they are not appropriate for all types of hearing impairment. At Lighthouse Senior Living, we foster a supportive living environment, while also providing access to premier medical care. We have found that proactively detecting and addressing any hearing impairment enables our residents to engage more fully in social activities and lead a richer, more vibrant life. Learn more about Lighthouse Senior Living or schedule a tour today.